"In nature a repulsive caterpillar turns into a lovely butterfly. But with humans it is the other way around: a lovely butterfly turns into a repulsive caterpillar." The container butterfly garden is now being visited by various butterfly species visitors: lots of Monarchs, several Cabbage Whites, and a few Sulphurs, or Sulfurs; the spelling dependent upon which side of the tracks you come from. Can't wait to start seeing swallowtail species stopping by. Margot Norris, who I wrote about in last week's entry, informed me that her milkweed plant is just about stripped clean and the six cats on it are getting very fat. Good work Margot! 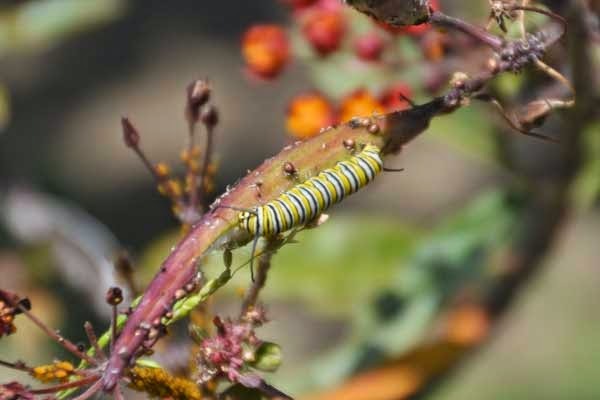 James Vaughn of Laguna Beach emailed me recently about his predicament with Monarch caterpillars on his milkweed plants at home and how they've stripped his plants bare also. Wanting to know if it's O.K. to move them to newer plants and how to go about it, he did an online search, learning that one way to perform this is to remove the leaf from the old plant with the caterpillar on it, then placing the leaf and cat on the new plant. This is a very safe way to transfer them, but a word of caution: make sure the caterpillar has firmly and completely transferred itself onto the new plant. If not, the leaf and cat may fall off and be lost below or even hurt itself. Personally, I gently pick up cats by gently squeezing them 'tween the thumb and the forefinger and carefully lifting. I've done it so many times now that it becomes second nature. Works well except for the tiniest of the tiny ones. Below are some photos James sent of his caterpillars. Gotta love those Oleander Aphids too: add a contrasty color splash. Happy transferring James! Monarch cat on a milkweed seed pod. Helga Robinson of Laguna Beach, California shared this wonderful little video produced by videographer Paul Hengstebeck, also of Laguna Beach. It follows the exploits of a Monarch caterpillar transplanted from Paul's garden outside to inside Paul's home, where our chubby friend (the caterpillar, not Paul) metamorphosizes into a chrysalis. According to Paul, this clip is a rough draft so to speak. At the moment, he is in the process of creating a more finished video. I'll post it also when ready. 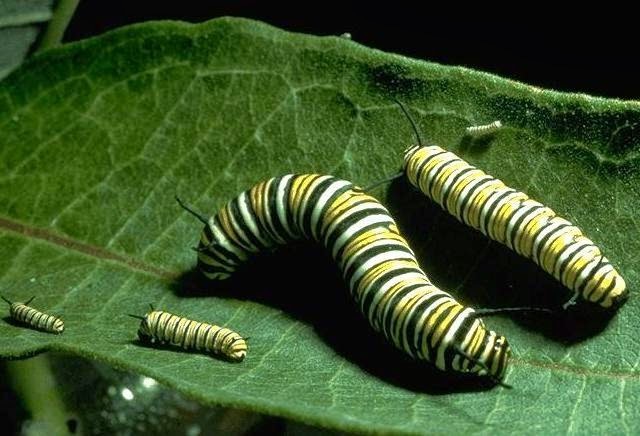 Good photo of Monarch caterpillars in its five various stages of instars. Are Monarch Butterflies Making a Comeback? is an article from a Monarch butterfly aficionado out of Bloomington, Minnesota. Sounds like 2014 will mark a turnaround point in the drastic eastern Monarch population decline. Hopefully, this uptick will last many more seasons. As for our western race, the southwestern drought we've been experiencing has surely put a dent in butterfly populations in general. It is most certain that wild stands of milkweed plants have felt its effect. 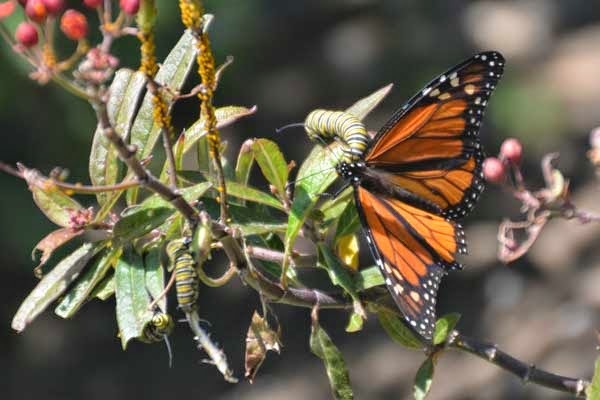 One mitigating factor though here on the west coast directly influencing Monarch population numbers has been the increasing awareness of the Monarch life cycle and its complete dependence on milkweed plants. 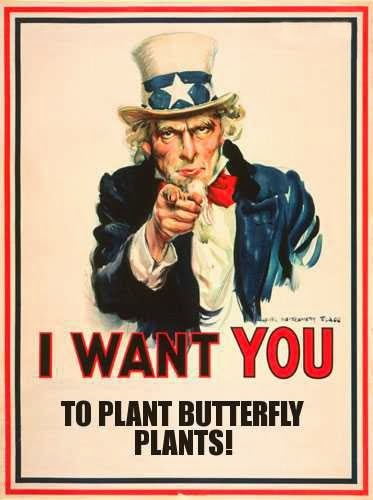 Here's a little primer for those who aren't aware of the Monarch butterfly life cycle and its total dependence on milkweeds: Plight of the Monarch. Some people are unaware for instance that there are two distinct races of Monarch butterflies in North America. Not only do milkweed plants afford food for Monarch caterpillars, their blooms produce copious amounts of nectar for all butterflies, bees, and other nectar-loving insects. 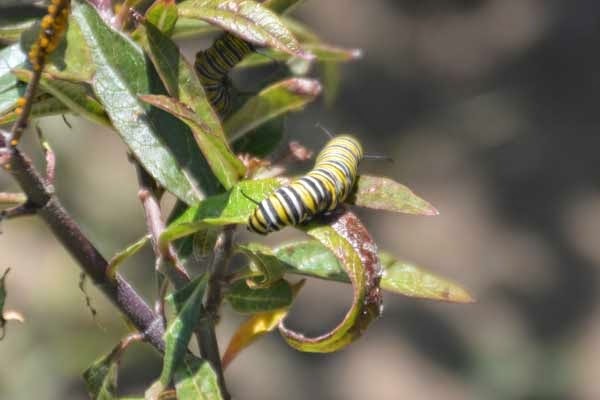 Those adding milkweeds to their gardens and those reintroducing native milkweeds to their original ranges certainly help support and bolster western Monarch populations. The container garden can certainly attest to that. Up until this year, hardly ever was a butterfly spotted around the house. Now, with butterfly-specific plants which includes healthy doses of various milkweeds, the yard is constantly being visited by various butterfly species, especially Monarchs.